Wow, thanks for featuring my bag! Ooh fun. Ever since I knocked out a Buttercup bag, I've been looking for some new patterns. Thanks! Jessica! Thanks for including me in this round up! so cool! thank you so much for all the links!! they really make me want to sew again!! Gee that's a great post! thank you. Oh.My. I can't wait for my kids to go to bed so I can pull out my sewing machine. THANK YOU! thanks so much::: i LOVE making bags. i will make one of these! super! This is exciting and what a fabulous roundup. Thank you!! These are wonderful. Thanks for always being so generous with your content and great finds. I'll be sure to pay it forward in one way or another. great compilation! Can't wait to get started. Thank you for taking the time to put this together. You are awesome! I know where the hamper full of plastic bags are going! Thanks a lot for these links! There are quite a few I want to give a try to make. As a beginner it is always a bit scary but the tutorials are great! ox I love internet tutorials! Thank you so much for including me in your roundup - and for providing a list of so many other lovelies for me to go off and investigate. Thanks for all the links to purses. I am in the process of going through different purse tutorials so I can learn how to do a perfect zip...well actually just to learn how to do a zip as till now I have avoided zips completely...zip phobia i think it's called! Thanks! I can't wait to try these if I could ever get my house decorated!! ha ha! I love making purses from online tutorials...I've done about 5. Thanks for some more inspiration! that's fantastic! thank you much for sharing! awesome! thank you, THANK YOU!! oh, you missed mine! Maybe for the next roundup? Here it is. Just finished all the grading. . . and now this gives me a project or two to do this summer (actually, to add to all the other projects I have but then, isn't that normal?). Thanks for the great list! That roomy pleated one is just what I need. Thanks for linking to my tutorial. I can't wait to check out some of the others! Thanks for these! I was just looking for some new bags to make. How nice of you to take the time to share so many great tutorials. super cute! Just made a few handbags for my sisters and mom for mothers day...this one was super cute and easy execution! Thanks for sharing this- you've gathered up some of my mental 'to do's' and introduced me to a few others! I'm sharing this is my friday favorites this week. Hope you have a great weekend! wow! thanks so much for this post. can't wait to start making more bags! Thanks for those links. Always love a freebie!! Pop on over to my website this week for a vintage block giveaway!! This makes me want to learn to sew! SO great. Thanks for sharing, I'm inspired! Oh! Thank you thank you thank you! Love all these ideas. 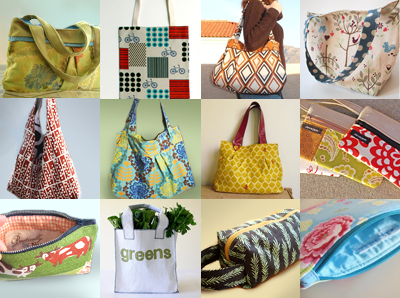 Consider an apron instead of a purse...another green idea! Thank you for a very nice round up. I hope to make a few bags this summer. A great round up! I've linked this to my blog to share with my readers. Thanks! Can't wait to make one, and get back to sewing again. I give up too easily, but this time I won't give up. Thank you! Its a great post! I made the lined zippered purses by Flossie Teacakes.... the most cute and hilarious instructions and EASY TO FOLLOW! I'm going to her blog now to give some feedback. WOW!!! I'm speechless. These are amazing. Thank you for being soooo generous!